In a strip mall in the heart of Torrance's Japanese community (and just a stone's throw away from Torihei), you'll find a restaurant that was, in its previous life, known as Kazan. Back in its day, Kazan was a solid, though somewhat unremarkable eatery, and thus, in July 2007, it was sold and rechristened Nozomi. Nozomi has, for the most part, stayed fairly low-key, remaining a locals-only type of joint, garnering its share of mixed reviews in the process. In fact, I wouldn't even have known about the place had it not been for one of my dining companions, who'd eaten here previously. The restaurant generally receives shipments of fish from the Tsukiji and Fukuoka fish markets on Tuesday and Friday, so we decided to visit on a Tuesday, figuring that we could grab the full attention of the kitchen on a typically "slow" night. Inside, it's about what you'd expect, with seating for about 40 people in a main dining area as well as two private rooms. We, of course, sat at the bar, front and center before the more senior sushi chef, Yasu-san (the other, off to the side, was Taka-san). Nozomi offers a fairly extensive menu of dishes, both cooked and raw, including such insipid items as California Rolls (see the complete menu on the official web site here), but the best way to dine at Nozomi is to toss the carte aside, and simply let the chef do his thing. During our meal, Yasu-san even mentioned that he was having fun, as he normally doesn't get to show off the extent of his abilities. 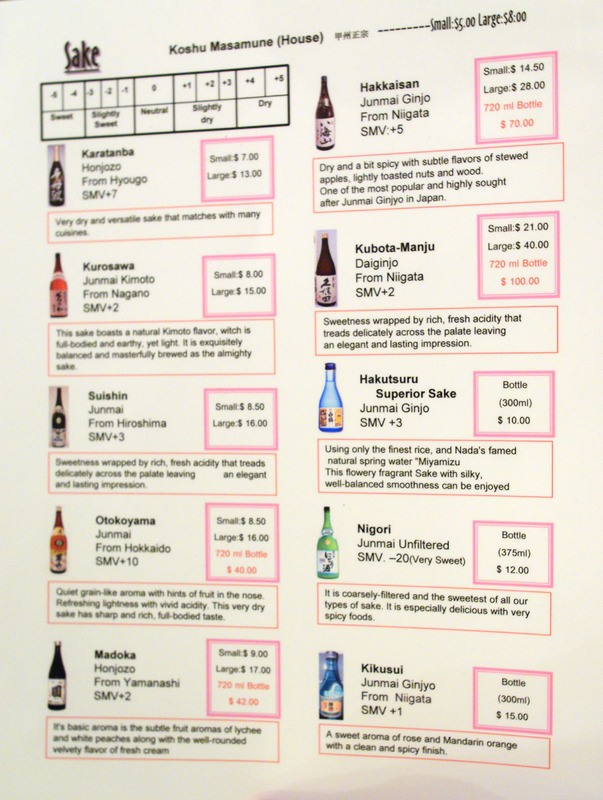 Above, we see Nozomi's drink menu; click for larger versions. 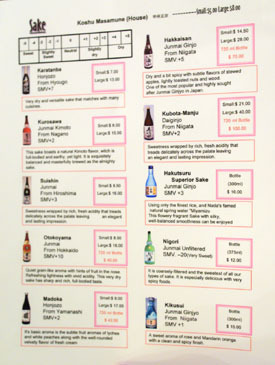 The restaurant offers a sundry selection of beer, wine, sake, and shochu, all at reasonable costs. Recently, I chided Torihei for their ridiculous sake prices. Fortunately, things are much more down to earth here; the high-end Kubota Manju that sold for $240 at Torihei is an affordable $100 at Nozomi. 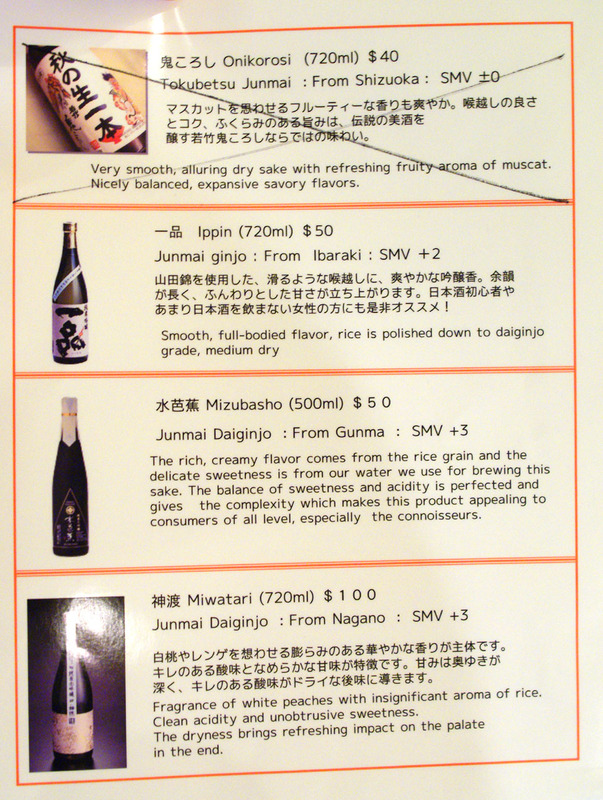 Interestingly, the premium sake list (the two photos on the right) was only brought out later, after the staff deemed us "worthy." 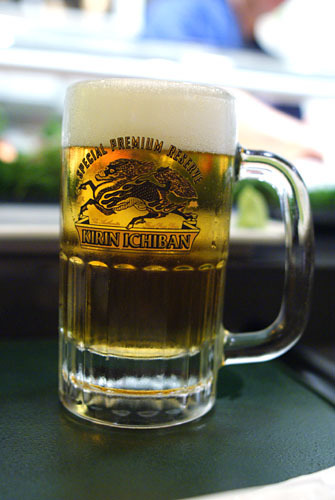 Though we would indulge in sake later on, we started simply, with frosty mugs of Kirin Ichiban on draught [$4]. Once we sat down, bowls of edamame were immediately brought before us. The soybeans were as they should be. Aji - Great use of scallion and ginger to counter the strength of the mackerel at first, with the aji's characteristic flavor coming through at the end. Itoyoridai - From Kyushu came this type of seabream (Nemipterus virgatus), which I'd never had before. 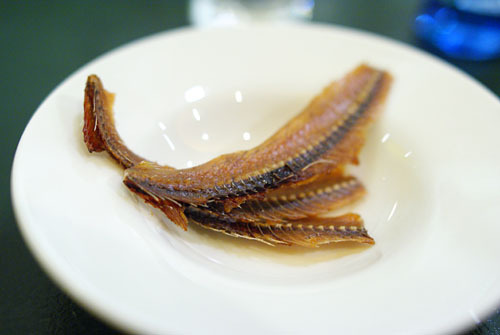 Also known as golden threadfin bream or hung sam in Chinese, it was soft, creamy almost, with a delectably mild flavor. Maguro - Two slabs of textbook tuna: clean, lean, with a lustrous cardinal-hued sheen. 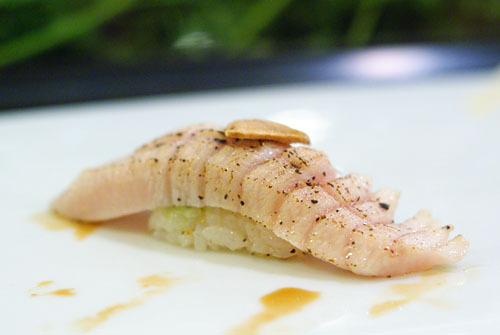 Kanpachi - Amberjack, delicately flavored with a lovely texture that seemed to transform from firm to creamy. 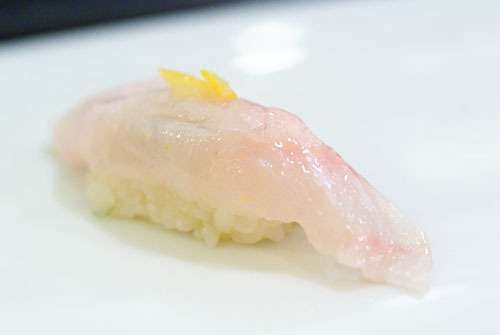 Madai - Red seabream snapper from Kyushu. Softly supple and subtly saporous, this went beautifully with the zesty sprouts. 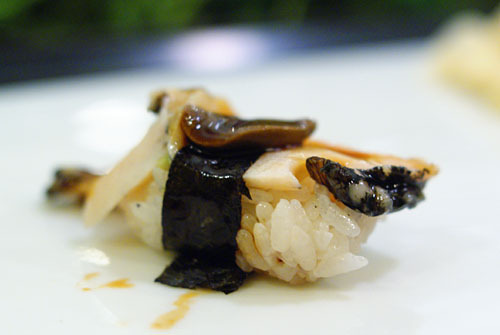 Aoyagi - Also known as orange clam, hen clam, and round clam, the aoyagi had a snappy, yet somewhat squishy consistency, with a marked brininess typical for the clam. 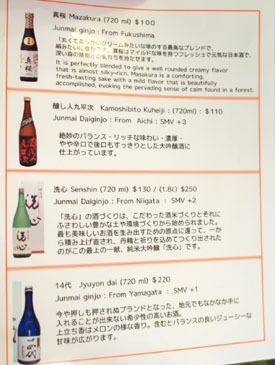 As mentioned before, we were deemed worthy of the premium sake list, and the most premium (and most expensive) of the bunch was Takagi Shuzo's Juyondai Junmai Ginjo [$220], from Yamagata. Its name means "14th generation," a nod to the current company chief, the 14th successive owner of the brewery. Although the kura dates all the way back to 1681, Juyondai's popularity has increased dramatically only recently, over the past decade. 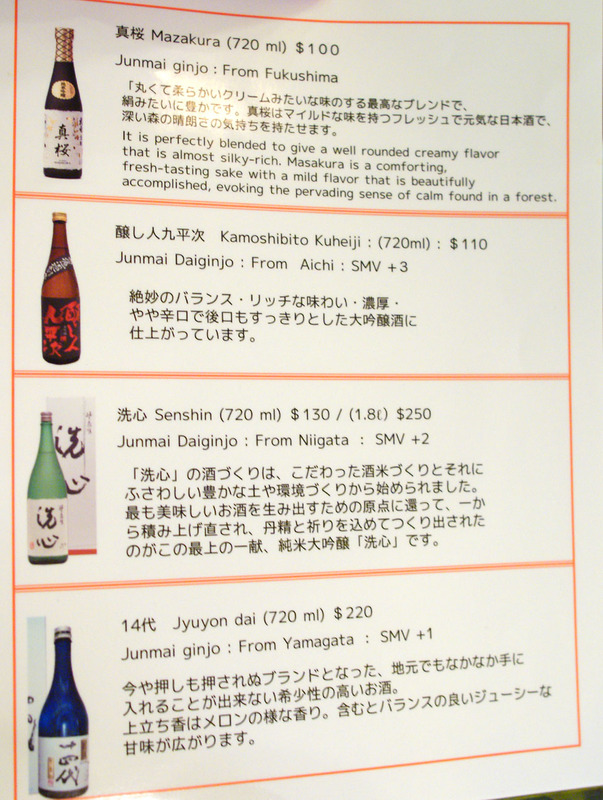 Despite this, Takagi Shuzo hasn't significantly increased prices or production, making bottles of Juyondai rather difficult to find. In fact, the only other place I've seen it is Urasawa. Tasting the sake though, I must say that its reputation is well-deserved. I noted an intense, heady bouquet bursting with green apple and tinged with a hint of floral character. The palate similarly exploded with apple essence, along with notes of melon and rice, with just a touch of heat on the finish. 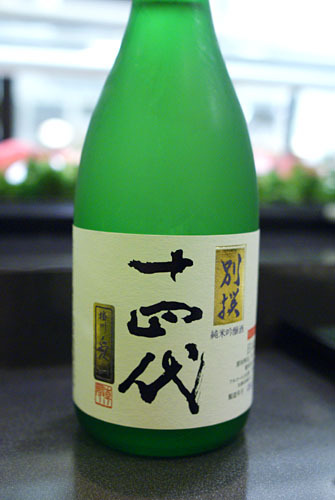 The sake possessed incredible finesse and complexity for "just" a junmai ginjo--one of my dining companions even likened it to a Bourgogne Blanc. 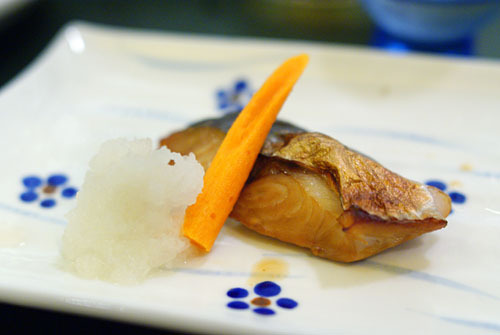 Here was sawara, or mackerel, grilled in a sweetish soy- and mirin-based sauce, garnished with daikon oroshi and yamagobo. I really enjoyed how the tare sauce was presented here, adding just the right amount of sweetness to the dish, all while preserving the natural fishy savor of the mackerel. Meanwhile, the yamagobo, a type of pickled burdock, mixed things up with its delightful crunch and tangy smack. Houbou - A new one for me, this was red gurnard (Chelidonichthys spinosus), also known as the blue fin sea robin. I loved its delightfully snappy texture and mild flavor, which went beautifully with the included ponzu dip. 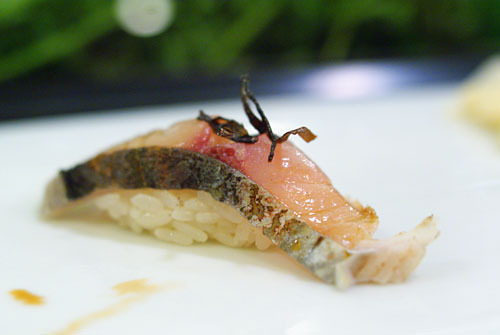 Masaba - Masaba, also known as hirasaba, merely refers to a specific type of mackerel: the chub or Pacific mackerel. The fish had a fantastic, firm, "meaty" body as well as a satisfying, "tangy" fishiness. Sawara - Compared to the aforementioned masaba, this mackerel had a much softer consistency as well as a surprisingly delicate flavor. It was superb with the grated ginger. Tako - Gorgeously soft, yet springy texture on the octopus, backed by a slightly sweet sapor with a hint of brine. Mirugai - Although it's usually quite crunchy in consistency, the geoduck here had a surprisingly soft bite, with just enough of that characteristic ocean-y brine on the close. Now began our gauntlet of sushi. First up: from Kyushu comes this arakabu, which I've also seen called kasago or mebaru in Japanese, and scorpion fish or rock fish in English. No matter the name, it was new to me. Served here with Himalayan salt and yuzu, it had a markedly firm texture, with a subtle flavor that was beautifully accented by the citrus. Yet another unprecedented fish for me was the mejina (or kuro or gure), a.k.a. black fish or nibbler in English. It came here topped with grated kyuri and myoga. 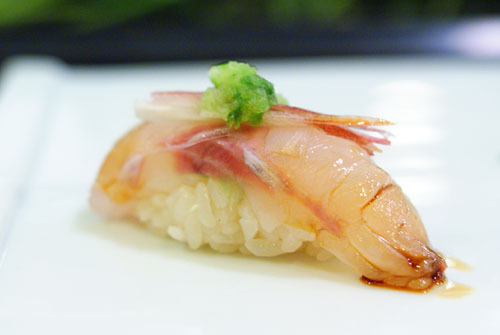 I loved how the cucumber added an overarching coolness to the nigiri, while the myoga contributed a distinct zestiness. Very good. 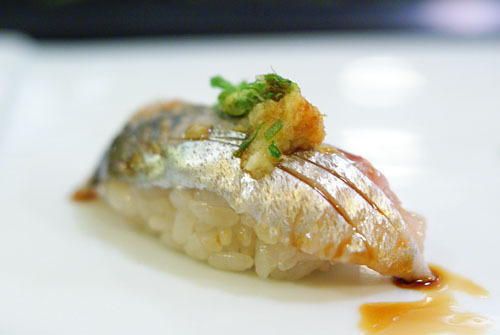 Iwashi, or sardine, is a fish that you don't see all that often offered as sushi. As you might expect, it demonstrated a rather pronounced fishiness, but its savor was beautifully balanced by the application of ginger and scallion (as you might find with aji). 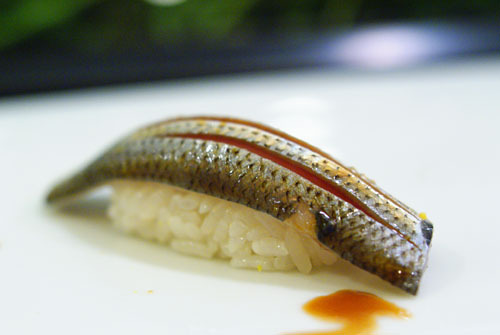 As we can see here, due to its silvery, shiny, scintillating, spotted skin, gizzard shad is usually one of the most visually striking fishes to been seen as a sushi topping. Its flavor was quite striking as well, with a pronounced brininess backed by a firm, dense, yet very pleasing texture. After eating the nigirizushi, I remarked to one of my dining companions how this was easily superior to the kohada I'd had recently at the new Bar Masa in Vegas. In fact, it was one of the strongest versions I'd had ever. Konbujime is a technique that's virtually unseen here in the States; in fact, I've only experienced it once previously, at Natori in Tokyo. It's a type of treatment in which fish (sole, in this case) is placed inside wet kombu in order to become infused with the kelp's flavor. In the process, moisture from the fish is also transferred to the kelp, resulting in a more concentrated taste, enhanced with a tinge of kelp. Such was the case here. 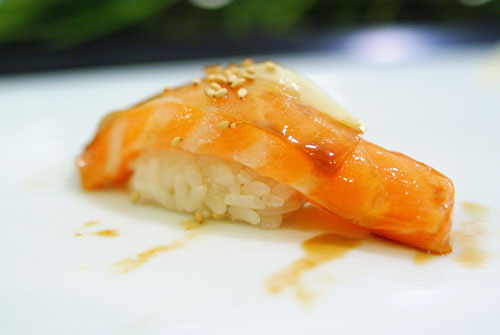 However, Yasu-san went a step further, adding a slice of hirame roe on top of the fish. This lent a palpable weight to the sushi, making the hirame so much more complex, and so much more enjoyable. 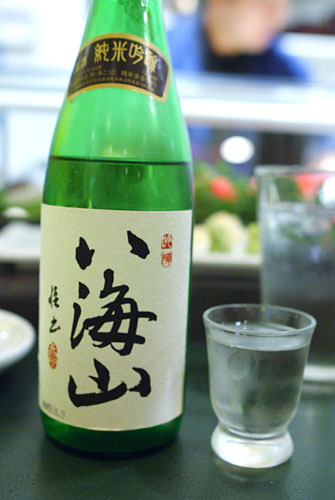 By this point, we'd run dry of the Juyondai, so we ordered up a bottle of our old trusty standby, the Hakkaisan Junmai Ginjo [$70] from Niigata. 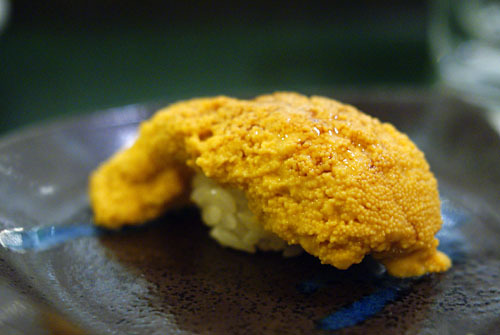 Here was an interesting combination, a duet of aoyagi himo and uni. The himo refers to the fringe of the orange clam, the flaps of flesh around the main muscle. It had all the flavor of the clam, but in a somewhat suppler body. I loved the interplay between the creaminess of the urchin and the great briny crunch of the aoyagi, all moderated by the vegetal tang of the accompanying greens. Here was mackerel, lightly seared, and topped with kombu and shio (salt). The searing seemed to bring out the oiliness of the sawara, but at the same time, it tempered its fishy sapor, resulting in a mildly flavored, but unctuous experience, finished with the briny touch of seaweed. Niiice. Tokobushi refers to a particular type of awabi: the round abalone, a tiny member of the family that usually grows to lengths of under three inches. It had a fantastic texture that was simultaneously crunchy, yet yielding, as well as a lovely, briny sapor that went superbly with the wasabi. The best part of this, though, was the sliver of liver up top, which added a wondrous weight and astringency to the sushi. 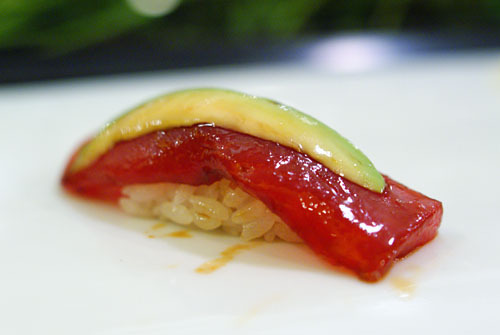 This wasn't your typical tuna, but rather, maguro that had been marinated in a soy-based sauce. The process added a noticeable depth of flavor to the otherwise mild fish, while the avocado served as a marked creamy, fatty complement. 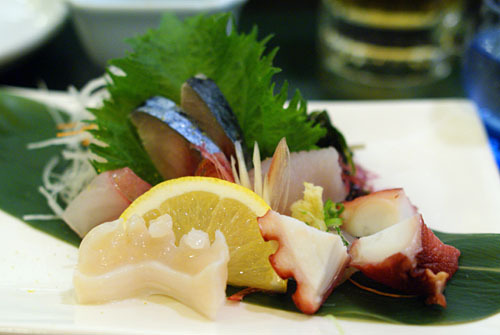 Surume ika refers to a specific type of squid, the Japanese common squid, or short-finned squid. Immensely chewy, creamy, and mouth-coating, the squid was subtly sweet in sapor, tinged by a light brine. The key here, though, was the squid's "hat," basically a gelatinous disk composed of the ika's innards. It added a profound gravity to the sushi that really took it to the next level for me. Nozomi is particularly proud of its uni, which is harvested off the Santa Barbara coast, home to some of the finest sea urchin in the world. Unlike much of the other uni out there, it's preserved not by the addition of chemicals, but rather by submersion in a saltwater solution. The resultant uni was characteristically creamy, but with a noticeably brinier flavor compared to most. Very nice. Here was toro, seared "like a steak" according to Yasu-san, meaning that is was cooked with garlic as well as salt and pepper. The tuna, thus, was undeniably unctuous in body, with a heavy, heady, unconscionably rich savor deftly accented by a touch of bitter char. And the garlic chip? Fantastic. These were the bones of the aforesaid kohada, deep fried into crispy, salty, delectable "crackers." I'll take a whole bag please! Salmon, capped with yuzu zest, battera kombu (pickled seaweed), and goma (sesame seeds). The various accoutrements added a much-needed complexity to the fish, imbuing the salmon with a nice tartness from the seaweed, along with a wonderful, overarching, earthy nuttiness courtesy of the sesame. Upon mastication, these tiny, tawny-tinted globules of salmon roe burst forcefully, with a mouth-coating, briny quintessence of the sea, subsequently tempered by the relative austerity of the nori seaweed wrapper. 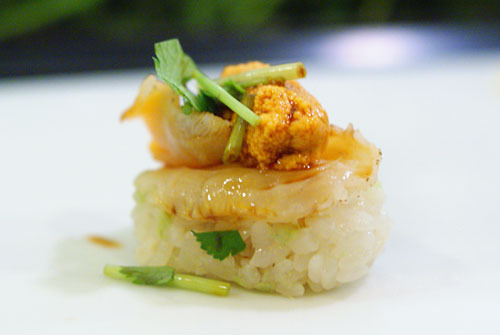 Shrimp harvested from the Red Sea, grilled by blowtorch, garnished with masago. When Yasu-san was cooking the ebi, I breathed in the heady aromas emitted, and could hardly wait to try the shrimp. 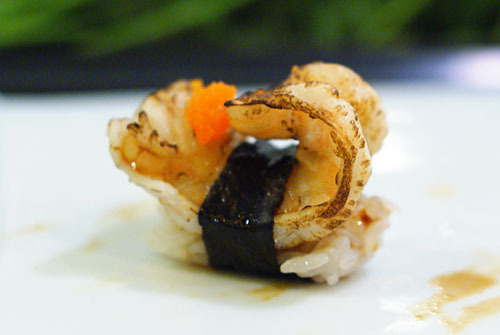 And indeed, the yaki ebi was delicious, sweet at first, but tinged with a touch of char. Yet, the crustacean's intrinsic brininess was preserved, making itself known on the close. The advent of the hosomaki signaled the end of the meal. 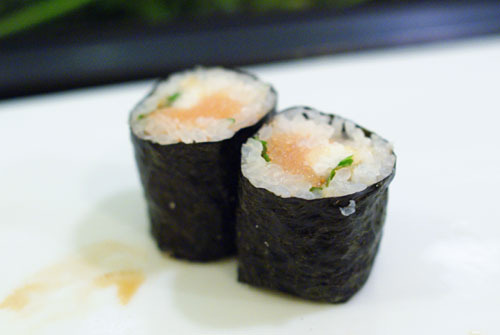 The first was a roll comprised of red pepper-infused cod roe from Kyushu, yamaimo (mountain yam), and shiso. 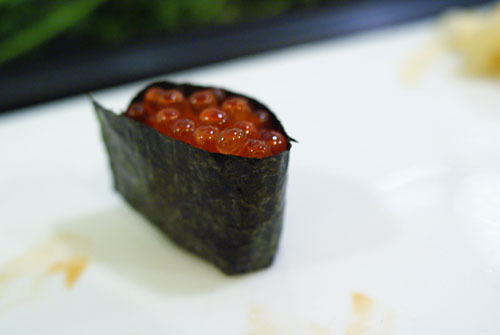 The roe, expectedly, was a commixture of spicy and salty flavors. It would've been overwhelming on its own, but was nicely tempered here by the juicy crispness of the yam, as well as the minty tang from the shiso. Next was the kanpyo roll, made from dried shavings of the calabash gourd. Think tart and crunchy, with a bit of heat from the wasabi. 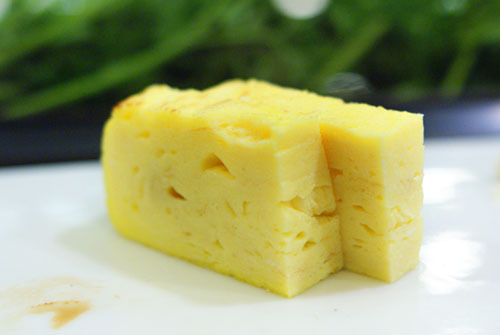 And finally, we closed with the tamago--delightfully fluffy and airy in body, with a subtle sweet "egginess." The tab came out to only $89.50 per person sans alcohol, which is a fantastic value. More importantly though, the food itself was shockingly good. I can't fault the quality of the raw ingredients, but what really sets the meal apart is the creativity and technique at play here. There was just so much going on that I'd never seen before, and which I absolutely enjoyed. This is a place that can cater to the California Roll crowd (the WASP-y couple behind us was keen on ordering Crunchy Rolls), but when you let the kitchen do what it's best at, I reckon that Nozomi can take on pretty much anything that the Westside can dish. Dude, the omakase was "only" $90? How does Nozomi rival to say, Zo?? I saw this place many times when I'm here for Torihei, so you're really perked up my interest to try it now! Thanks for the post, There are sevel dish I'll love to try myself. 1)Itoyoridai are use in Kagoshima Prefecture while the Akana are use in the remaining of Kyushu. 2)Arakabu are the regional name use in Kagoshima Prefecture, Kashira are use in Kansei area ( the prefectures of Mie, Nara, Wakayama, Kyoto, Osaka, Hyōgo, and Shiga.) Booku in Shimane Prefecture, Mebaru use in Hokkaido, finally Kasago are use in remaining of Japan. 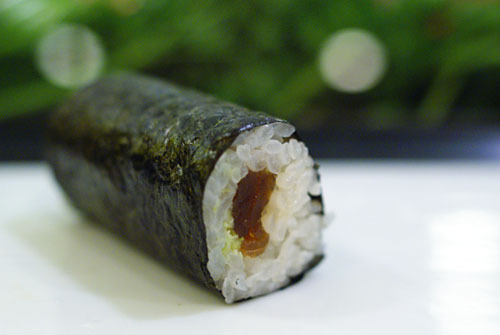 3) Kure/Gure are use in Western part of Japan, Kuro are use in Kyushu, Mejina are use in Kagoshima. 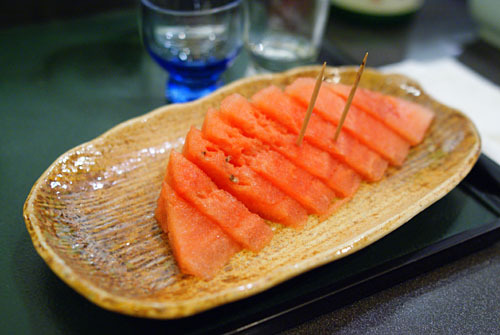 As for your Q about watermelon, i'll say its from Japan, winter watermelon are use as a "speical" gift in Japan, as you will see from the price ~$2100yen. Once again, thanks for the post and have a happy New Year. 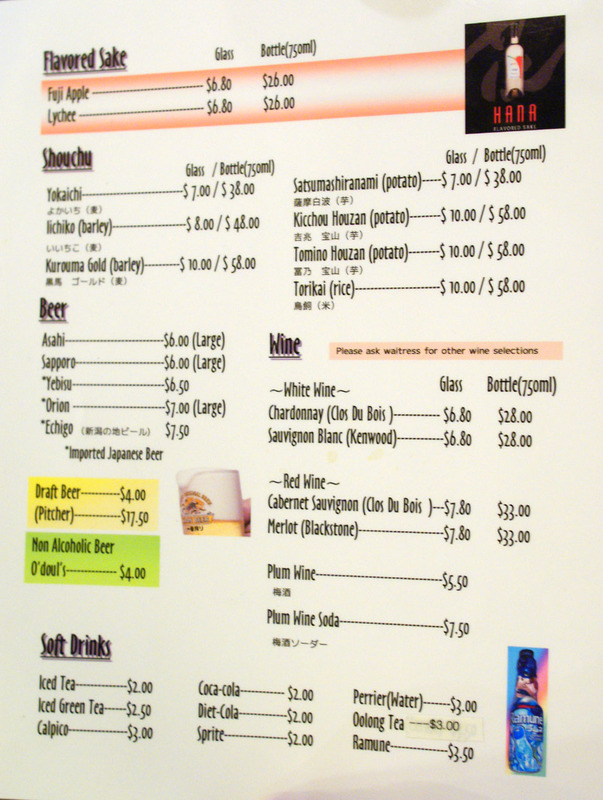 On their menu they offer Edamame and Premiun Edamame, what is the difference? Which one do you have? I will have too say this is the first time I see Kamameshi are offer on the menu. I definelly gonna to try it in August. Glad to see you finally made it to Nozomi. We are regulars there - we far prefer it to Zo et al. Fantasic quality and creativity for great value. I realize you went on a Tuesday, but it is important to note that Wed and Friday are typically their best days as that is when they get their "Omakase" shipment from Japan. They have been known to have as many as 10 different kinds of snapper/whitefish on those days. Also, it is also worth noting that Mark the manager just married the daughter of the top Uni purveyors in Santa Barbara - the company responsible for a lot of the high end stuff that gets shipped to Japan. We call her the "Uni Princess." As a result, their uni is some of the best in LA, comparable with Urasawa, Mori, etc IMHO. BTW, the Kamemeshi is quite good and perfect for a chilly night. I always have a hard time choosing between that and their Chazuke, which is also of excellent quality. Happy New Year! Any special plans for 2010? Like traveling outside the U.S? I'm rooting for elBulli. I sent in my rezzy the other day. It's going to be a long two weeks. Danny: Yes, "only," relative to some of the other meals we've had. The experience is arguably comparable to Zo, and easily better than the likes of Echigo. Dason: I forgot to ask where Yasu-san is from. Kagoshima seems like a reasonable estimation though, given what you wrote. 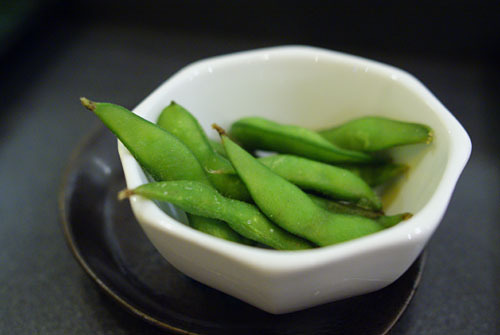 I was wondering about the edamame as well; unfortunately I don't know what the distinction is, nor which type we had. And finally, this is the first time I've seen kamameshi offered as well. Happy new year to you too. Andrea: Can you confirm that it's Wednesday and Friday? We were told Tuesday and Friday specifically (that's why we went on a Tuesday). I do agree about the quality of the uni--'twas lovely. What's Mark's background? He's the owner too right? And do you know what exactly happened with Kazan? Jocelyn: Thanks! No plans for international travel yet this year, though I may be going to Washington DC at the end of the month (Citronelle, CityZen, Inn at Little Washington, Minibar, Volt?). What about you? Citronelle's chef table, ~13 course, ~13 bottle of wine, they would not do it for less than 6, caz' they believe and call it a "life event"
Equinox - even thruogh is currently close due to a fire, I love chef Todd Gray for completly using local and organic product. 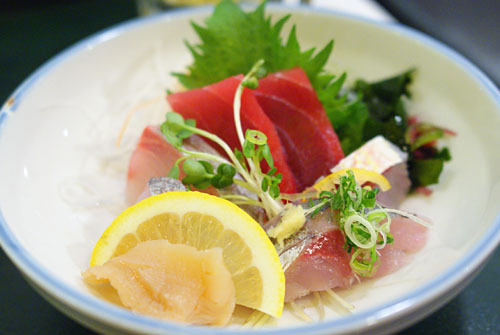 Kaz Sushi - Since it is winter, call and check when is the next Fugu dinner, they are also known for Sushi and wine pairing. BTW, i did some research on Edamame and Premiun Edamame. There are two type, green and Kuro (black) type , the green are reg, Kuro are premiun. Kuro Edamame are light brown-green soybean grown in Shizuoka and Kagoshima Prefecture. According to wiki Japan, they are tastier and better for you and it's consider a “delicacy”. bigger and have a hint of brown in it. I hope you go to Washington DC. I just booked travel arrangements for March (work-related) so I have about four chances to get into MiniBar. Definitely doing CityZen. I'm also going check out the burgers at Palena. Dason: Thanks for the recommendations; I'll run them by my dining companions. Also, I appreciate the info about the edamame--looks like we just had the "regular." Anon: I understand your concern. I never intended to equate WASPs to the California Roll crowd. I wanted to use the term "WASP-y" merely to indicate the couple's physical appearance. Jocelyn: Nice. So Palena, CityZen, and MiniBar maybe. Are there any other places you're going? Wow, your pictures are amazing. 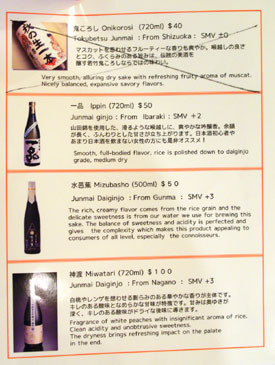 I need to go to Nozomi now to get more. So I called to make a reservation, and got the answer on the Omakase. We are both right. They get the shipment in on Tuesdays, but Mark thinks it is better to come on Wednesdays as the fish mellows out some. I was going to go tonight, but he told me the fish market was closed and they won't have the Omakase until friday this week. The next time I am there I will let you know the answers to your other questions. 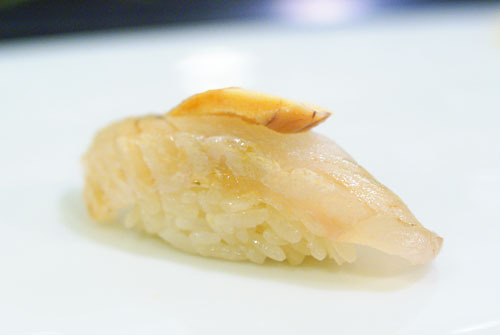 The next time you go, request something with the Ponzu gel. Yasu-San likes to dabble in molecular gastronomy, it is the only picture I have posted from this restaurant. It is on a type of snapper called "Threeline Grunt"
Ok, I just booked Citronelle. So far I'm going to CityZen, Palena, Citronelle and maybe Minibar. No plans on my first night since I'm flying in late, around 8'ish. I hear Komi has a no photo policy. I wonder why? Andrea: Ahh, thanks for the update. 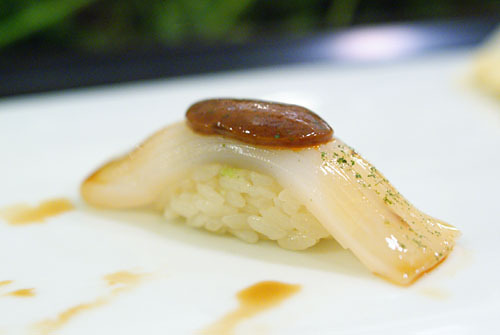 Is the ponzu gel related to the gelatinous squid innards disk? Are there other molecular dalliances to speak of? Looking forward to hearing about the rest! Jocelyn: It looks like I may not get to go to DC after all. :( Regarding Komi, I believe that the chef doesn't want others to "steal" his ideas. I know that the restaurant didn't always have the policy though. actually thank YOU for the introduction to nozomi! new follower, and loooving your posts. Yvette, I look forward to seeing more from your new blog! I'm actually not aware of different levels of omakase. Next time, I would suggest telling the Chef that you're looking to spend around $90 for 20 items and see what he comes up with.